The election fever has begun way before the legitimate campaign period. The festivity has found its way into social media platforms which makes one wonder about the possibilities for good governance in the country: what would happen if the same amount of rigor, energy and resources poured into campaigning are also dedicated for social accountability? A concerned citizen can also make a direct impact by playing a more active role in the smallest local government unit in the Philippines, the barangay. There are over 42,036 barangays all over the Philippines, many of which are home to Filipino households who still lack access to basic services and whose causes are merely enveloped in the motherhood statements pronounced during electoral campaigns. (8) Satellite and public market, where viable. The Barangay Assembly is an avenue to “hear and discuss semestral reports of the sangguniang barangay concerning its activities and finances as well as problems affecting the barangay.” The Barangay Assembly Day for the First Semester of 2016 is ideally scheduled on March 26, 2016 (Proclamation No. 260). (c) Hear and pass upon the semestral report of the sangguniang barangay concerning its activities and finances. The truth is, very few convey interest concerning the Barangay Assembly. The barangay, although perceived as confined and lackluster compared to its upper tier local government units, holds a lot of potential for positive change. (1) Deliver the State of Barangay Address (SOBA). (2) Discuss barangay compliance to posting of Barangay Budget, Statement of Income and Expenditures and other Barangay Financial Transactions, and Annual Procurement Plan. (3) Discuss barangay compliance to the revitalization of the Barangay Anti-Drug Abuse Council. (5) Present to the assembly members the proposed priority projects to be funded under the Barangay Bottom-Up Budgeting (BBuB) funds. (7) Invite members of faith-based organizations within the barangay, Ugnayan ng Barangay at Simbahan (UBAS) and other Civil Society Organizations to attend in the assembly and enjoin them to provide necessary support in the discussion of their involvement in monitoring the project under the Barangay Bottom-Up Budgeting Process and in advocacy for good local governance. These activities present opportunities for interaction on a vast array of topics on transparency, accountability, efficiency, budget allocation, participation, including disaster preparedness. In the end, the quality and depth of the agreements will help shape barangay good governance and will have a direct and personal impact to households residing in that barangay. 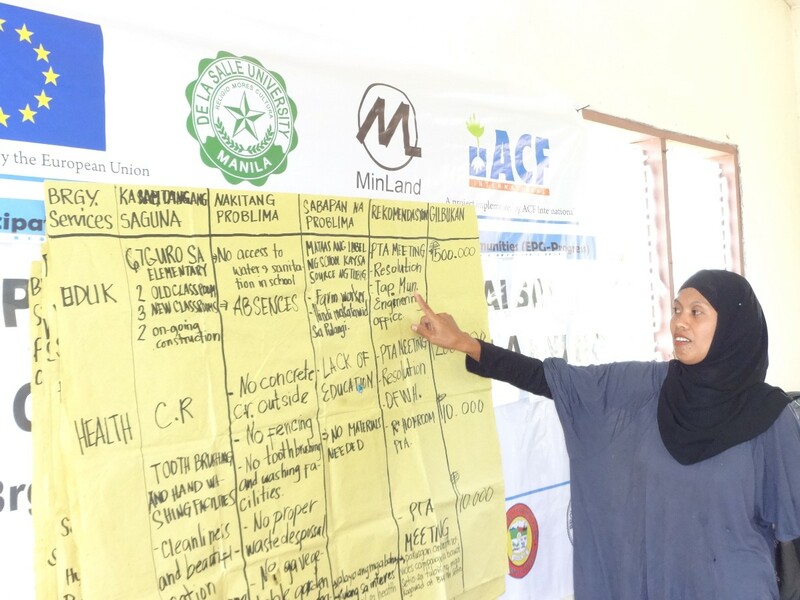 Action Against Hunger and Mindanao Land Foundation provide technical assistance and mentoring support to civil society organizations within the Arakan Valley Complex (Municipalities of Antipas, Arakan, Magpet, Matalam, and President Roxas) in North Cotabato Province. In its last year of implementation, the project, Empowering Participatory Governance towards Progress (EPG-Progress) has helped create civil society organization (CSO) networks, catalysed the appointment of CSO Desk Officers and encouraged local governments to share their power, by allowing CSOs to monitor their performance using available tools and mechanisms and by devoting significant resources for CSOs. 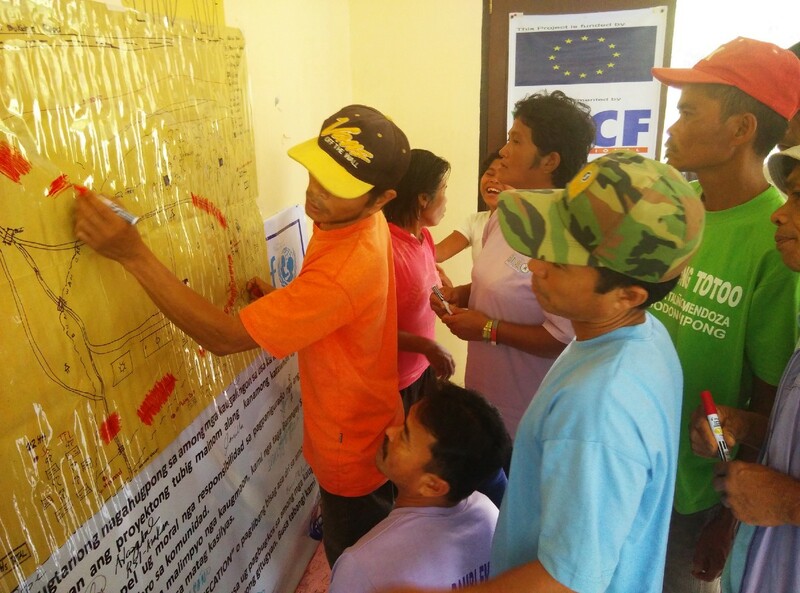 EPG-Progress, funded by the European Union, also provides capacity-building to barangay officials to strengthen them as they develop robust develop plans and legislate comprehensive policies. In the upcoming Barangay Assembly, the project is expecting that there will be increased participation all over the project areas as civil society networks in each municipality will encourage basic sector organizations to engage. -There is uneven capacity among barangay officials and civil society leaders. - Capacitation on barangay good governance is insufficient. 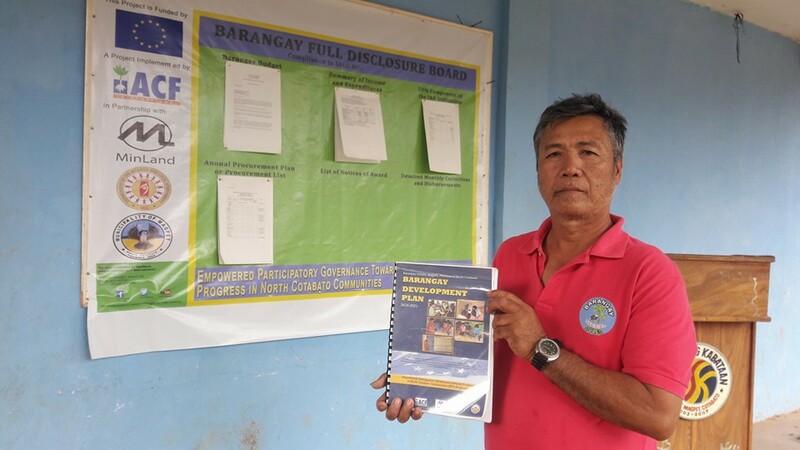 - Mechanism for CSO participation in the barangays is not clearly provided; CSOs found at the barangay level are generally basic sector organizations which regional government agencies have helped form in lieu of respective programs. - Other organized groups in the barangays are not income generating, largely composed of volunteers who are focused on raising support for livelihood projects. - A bulk of the barangay income is spent on personal services with miniscule amounts left for fulfilling devolved functions of the barangay. -There is lack of interest from citizens and CSOs to fulfil a watchdog role in ensuring that the remaining barangay fund is prioritized for the benefit of the communities within the barangay. If these realities are common to most of the barangays, all the more should citizens and CSOs show up and participate in the barangay assemblies in their respective barangays. Moreover, the Local Government Code states that “corresponding administrative complaint against barangay officials who fail to conduct a barangay assembly may be filed by any resident of the barangay, concerned citizen, governmental or non-governmental entity before the sangguniang panglungsod or sangguniang bayan concerned. Indeed, concerned citizens should occupy the barangay on March 26. In Barangay Doles, Magpet, Emma Pacete, president of the Doles IP Workers’ Organization is passionate about contributing to good governance in her barangay. One of the active participants to EPG-Progress’ Advocacy Training, she maximized her lobbying skills and successfully influenced the municipal mayor to appoint a CSO Desk Officer. Doles is also one of the few barangays in the province constituted of indigenous people which actually has an IP Hall. Emma is contributing a great deal to nation building by being present and engaged in her barangay. We, too, can make our humble contribution. Let us occupy our barangay halls in the incoming barangay assemblies.